Abstract: GISETTE is a handwritten digit recognition problem. The problem is to separate the highly confusible digits '4' and '9'. This dataset is one of five datasets of the NIPS 2003 feature selection challenge. The data set was constructed from the MNIST data that is made available by Yann LeCun and Corinna Cortes at http://yann.lecun.com/exdb/mnist/. The digits have been size-normalized and centered in a fixed-size image of dimension 28x28. The original data were modified for the purpose of the feature selection challenge. 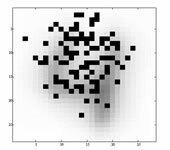 In particular, pixels were samples at random in the middle top part of the feature containing the information necessary to disambiguate 4 from 9 and higher order features were created as products of these pixels to plunge the problem in a higher dimensional feature space. We also added a number of distractor features called 'probes' having no predictive power. The order of the features and patterns were randomized. dataname_train.data: Training set (a coma delimited regular matrix, patterns in lines, features in columns). We do not provide attribute information to avoid biasing the feature selection process. Isabelle Guyon, et al, 2007. Competitive baseline methods set new standards for the NIPS 2003 feature selection benchmark. Pattern Recognition Letters 28 (2007) 14381444.